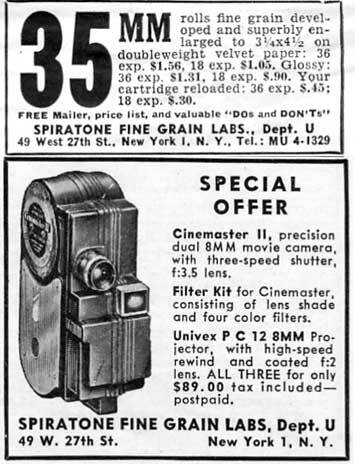 Spiratone began life as a mail-order lab (hence the name), but became a major source of accessories, gadgets, and miscellaneous fun stuff after the war. I didn't often buy from them, but when my copy of Modern Photography arrived in the mail, I always enjoyed looking through their ads to see what they offered. It was the photographic equivalent to the Edmund Scientific and the Johnson Smith novelty catalogs. Spiratone's ads ran from the 1940s through the late 80s, when owner Fred Spira retired and the business shut down. I've randomly chosen to scan ads at approximately 5 year intervals and present them here. Partly it's a hat-tip to Spiratone, and partly as a window to the kinds of things people were interested in and buying at the time. 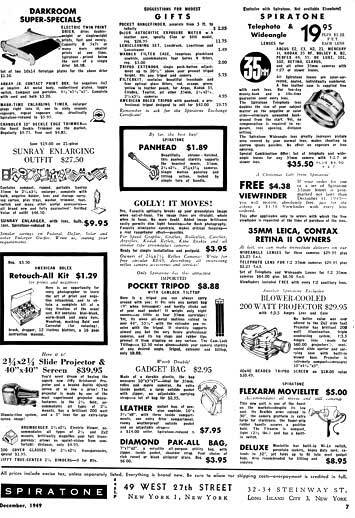 On the left are two of the oldest ads I could find, the upper is from March 1946, the lower in November, both from the back pages of US Camera. The one on the right is from 1949 and appeared in Popular Photography. You can see how rapidly they moved from souping film to selling stuff.